Posted on April 26, 2014 by Worth Stopping By . . .
Fortunately, we have always loved old-fashioned oatmeal. Whole oat grains are rolled leaving the oat bran and germ intact — very healthy. The bran is a great source of natural fiber, and the germ is rich in minerals and nutrients. All of this is lost in quick-cooking and instant varieties. Plus, you can always boost the nutritional value any time you add fresh fruit to the mix. 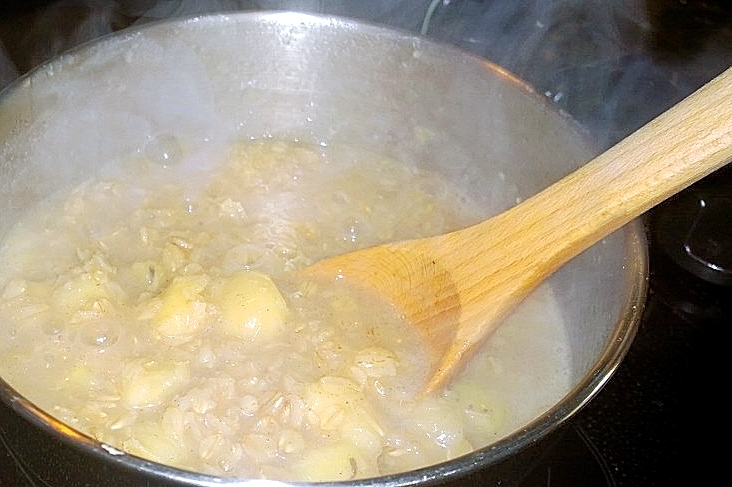 Just add the fruit of your choice along with the oats and allow them to steep and cook down until soft. A great, and delicious, way to start the day! 1. Bring water/milk to a boil in a small saucepan. 2. Add oats, banana, brown sugar, honey, and cinnamon. Continue to cook over medium heat for 5 minutes, stirring occasionally, until thickened.